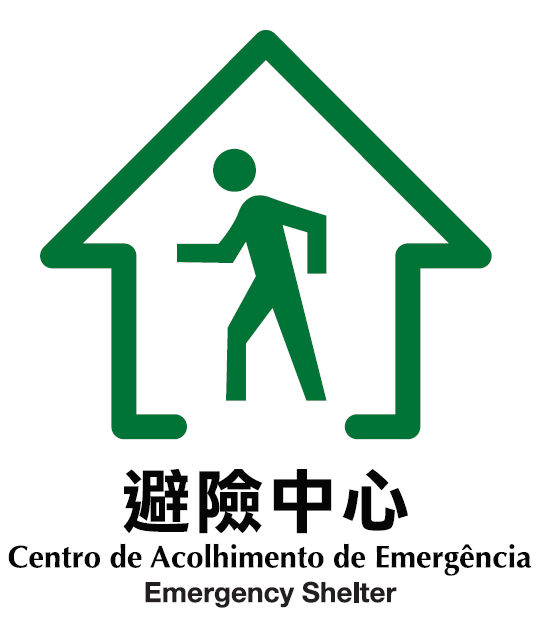 The Cold Shelter, situated at Rua do Asilo of “Ilha Verde”, will be open to the public, when Macao temperature falls to 12.º C or below. The site of Public Relief Society Social Welfare Bureau grows out of Public Charity Society which was created in 1938 and provided the poor citizens with “relief” (in cash or in kind) service; its major service was to provide all the social organizations that carried out relief service with financial assistance, at the same time, it was a social service organization that delivered relief benefits to the poor persons, supervised and took care of all the orphans taken in, abandoned babies and poor persons. In 1947, the government reorganized the framework of its departments and established Public Relief Society. In the process of the reform, it included the relief cause carried out by the Society and the relief targets were poor persons, lepers, orphans, abandoned babies, misfortune adolescents, pregnant woman and baby so as to provide the public with relief service that had a broader coverage. And it delivered relief benefits to the poor persons and families. At the same time, it established a system of social relief card to conduct an economic and social investigation on all the poor families and persons who claimed for assistance; the social relief card would be delivered after investigation and approval to increase the utilization efficiency of resources and to put the limited resources into the hand of persons who had such a need. (in 60s) In 1960, Public Relief Society was reorganized as Public Relief Branch and its services were developed with many different types of services such as meal service, service for victims of disaster, etc. And it gradually promoted the construction of Macao social service facilities such as canteen, centre for victims of disaster, rehabilitation centre, and blind persons centre. The administration also devoted itself to build public houses. In accordance with the Legislative Decree No.1755 in 1967, Public Relief Branch was reshuffled to become Social Relief Division with improved services, for example, it strengthened the service to provide the deaf and blind people with education and rehabilitation services. It continued to be involved in poverty fight and provided the citizens with financial assistance. In addition, Social Relief Branch was responsible totally for the health cost of the poor persons and provided the poor students with half amount of financial assistance for their tuition fee and meal cost. The Branch was also involved in work of stopping drinking, giving up drug and solving other social problems for the citizens. More and more homes for the elderly, homes for the disabled and nurseries had been established. Later on, the canteen of Social Relief Branch provided the students with free meals. One of the priorities of the Branch at that time was to develop and build houses for the poor families. The Branch did not provide only single relief service; it began to develop in the direction of diversified social services. (in 80s) On January 1, 1980, Social Relief Division was reorganized according to 27-C/79M Decree of 1979 and was officially named as Macao Department for Social Welfare. The services provided by the Department were improved and upgraded to professional ones and it required that staff being engaged in social welfare must be at adequate educational level. The Department would solve difficult problems for the citizens and develop social services by means of professional interference. Later, the structure and staff of Macao Department for Social Welfare were reorganized in accordance with the Ordinance No.149/80/M, Decree No.95/84/M and Ordinance No.188/85/M, as well as established Macao Social Welfare System through the Decree No.52/86/M in 1986. Macao Department for Social Welfare was further reorganized to be composed of Macao Governor, Macau Social Welfare Committee and Macao Department for Social Welfare, clearly addressed its objectives of service – providing persons and organizations in poor economic situations with social assistance in cash or in kind or by technical support, promoting the social welfare cause for individuals and families, and proceeding in the work of community development. It also proposed four principles: equality, efficiency, mutual assistance and participation. To make it convenient for help seekers, the Department set up four sub-unit offices (“Santo António e São Lázaro” sub-unit office, “São Lourenço e Sé” sub-unit office, “Nossa Senhora de Fátima” sub-unit office, and “Ilhas” sub-unit office) so that they could claim for service at one of the sub-unit offices which was near their living place. Another purpose of setting up offices at different parishes was to make the staff go into the midst of the general public, understand the need of the society, and develop services that meet the demands of the citizens. In addition, it set up Department of Research and Planning in order to develop the social service in a more scientific and rational level. Since 1990, the task of social house service has been independent from Macao Department for Social Welfare, and we focus our resources on the development of social assistance and open up new areas of social service. Apart from the economic assistance and the assistance in kind offered to the citizens, the Department devoted itself to casework counselling in response to the serious and complicated issue of families and adolescents over time. The Department also developed vastly all kinds of social service indirectly by strengthening the technical and financial assistance provided to non-governmental organizations. And it increased more social service facilities that were demanded by the society such as nurseries, centres for the elderly, community centres, etc. In order to respond to the increasing demand of the citizens of northern zone for social services, the Department set up “Ilha Verde” sub-unit office (the fifth sub-unit office of the Department) in 1995, and provided more services to the citizens of the northern zone. Noting that the family issue of Macao became more and more complicated, the Department set up “Family Counselling and Assistance Office” in 1998 which was composed of staff of different professions (such as social workers, educators, psychologists, and legal advisors) to provide problem families with more detailed and professional assistance and counselling by way of inter-disciplinary. In accordance with the Decree No.24/99/M in 1999, Macao Department for Social Welfare was reorganized again internally; in addition to the restructure of the original administrative framework, some subsidiaries that had been operating on pilot program for many years were officially established into the structure; and it added the task of the prevention and treatment of drug dependence. As a result, the whole operation framework can provide service in a more efficient way, responding to the demand of the citizens immensely, solving the problems of the citizens concerning individuals, families and the community and improving the welfare of the population. The reorganization this time stresses the functions of family service and social mutual assistance to achieve the general objective of “helping people to overcome difficulties, and building up new life together”. To this end, Department for Social Service that was responsible for providing direct service was separated into two departments, Department of Family and Community Service and Department of Social Solidarity. After the reorganization, Social Welfare Bureau set up Administrative Council, besides Director and Deputy Director. Under the Director, there are five departments, eight divisions and three sections. In addition, five social service centres (i.e. the sub-unit offices in the past) distributed in different zones of Macao and Family Counselling Office that provides direct family service to the citizens. Social Welfare Bureau With the handover of Macao to China on 20 December 1999, Macao Department for Social Welfare was renamed Social Welfare Bureau (IAS). Under the principle of “the people of Macao governing Macao” and “a high degree of autonomy”, IAS cooperates with various social service organizations, and strives to meet the needs of society through welfare, services, policies, laws, and regulations. Since the handover, several advisory committees have been set up in addition to the Social Welfare Committee, including the Committee for Senior Citizen Affairs, the Committee for Rehabilitation Affairs, the Narcotics Control Committee, and the Committee for Women and Children Affairs. In the meantime, improvements have also been made in social services, targeted at different areas such as single-parent families, child care, problem gambling prevention, food bank, youth outreach, new integrated family services, and social enterprises. In recent years, cooperation between IAS and social service organizations has moved to a new stage. In 2015, the funding system was reformed so as to create better conditions for the sustainable development of social services. In line with the needs of social development and social services as well as the Administrative Regulation 28/2015, IAS was reorganized on 1 January 2016 to optimize and rationalize the function division in social services. The function of social reintegration was added, and the administrative structure was expanded to include 1 Director, 2 Deputy Directors, 6 departments and 17 divisions. At present, the services cover social assistance, individuals, families, children and adolescents, senior citizens, rehabilitation, drug dependence, the prevention and treatment of problem gambling, social reintegration and other areas, with the aim of providing more diversified and professional services to the public.